Where do beats begin and where does tonality end? You can find the answer in a forest of steel trees composed of resonant bark during a spectral thunderstorm“. The aim of my research project is the merger of melodic and percussion elements resulting into one conglomeration. Drum sets become more tonal without loosing their characteristic noise-like sound. The ambition is to create entirely new sounds and complex forms driven by beat sequences which can be played via claviature. My musical research focuses on a merger of melodic and percussive elements into one conglomeration. I approach my theme at two levels: 1. The sound design of percussive elements and 2. The tonal sequencing in and of this special sounds. Applied Kyma instruments and effects are almost exclusively based on the SlipStick model. Thereby, SlipStick operates as an engine of sound synthesis. Simultaneously, it induces and influences other forms of synthesis as Frequency Modulation, Physical Modelling and Resynthesis including the combination and influence of one and the other. Subsequently, single sounds are multiplied by the Replicator. Thereby, highly complex and lively sounds are being created. The intended tonality of percussive sounds is underpinned by the modification of Euclidean and Non-Euclidean rhythms. These rhythms were chosen because the structure of these algorithms may be used to generate very native percussive sequences, which can be modified by shifting tone pitches and other variances leading to a mergence in tonality and a subsequent collapse. A special developed Kyma sequencer, the core of my setup, can be played in half tone steps and creates instrumental sounds, which will surprise everyone. 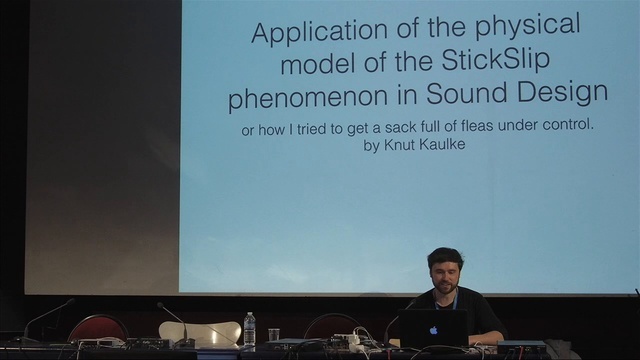 In my demo I will show some techniques in how to excite SlipStick and how to use SlipStick as an exciter of sound synthesis. Furthermore, I will share some modification hints leading to a more lively sound.